Looking for the perfect way to celebrate Valentine’s day? How about visiting Orphans of the Storm® to find your newest dog friend who will love you furever and ever? There are lovable dogs of all shapes, ages, and sizes waiting for the perfect family to discover them and take them home! 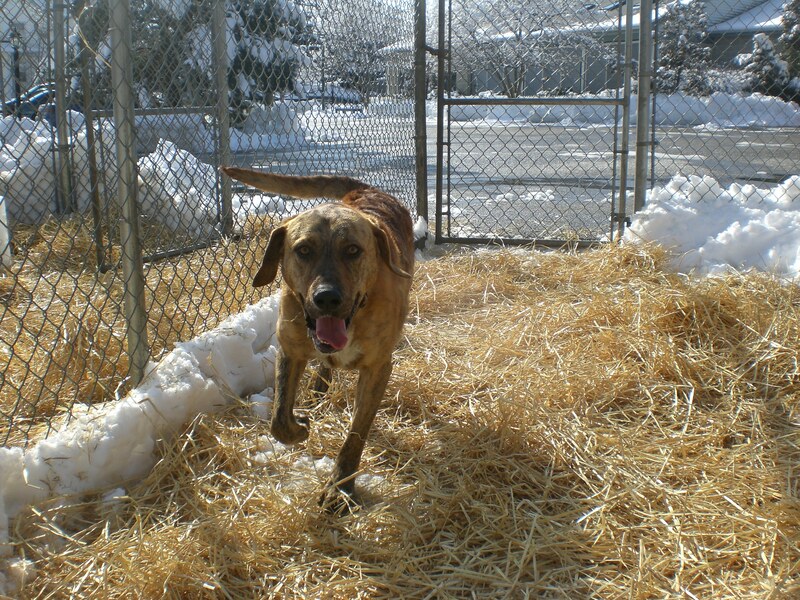 Sage the one-year-old Labrador Retriever/Border Collie mix is full of energy! Being a younger dog, and a mix of two very active breeds, you can’t expect anything less. 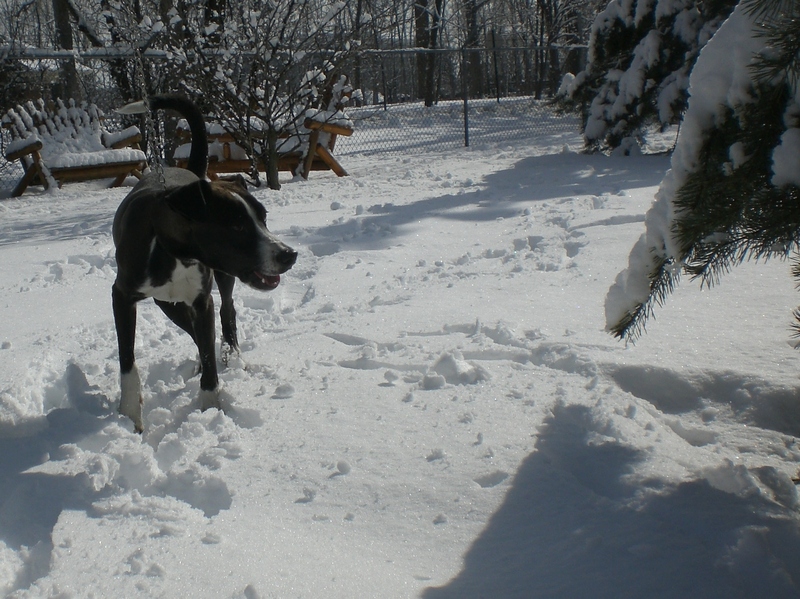 He was so happy to go romping through the snow, and kept wanting to play with his kennelmate (see below). Sage will most likely be very easy to train and an eager learner. Sage would definitely do best in an active home with a walking or running buddy, and plenty of toys to keep him stimulated. He’s a big sweetie, though, so once you tucker him out with all of his activity, he will be more than happy to snuggle up to you. Is Sage the pooch for you? Piper the two-year-old Hound mix is currently Sage’s kennelmate, and she is super cute. 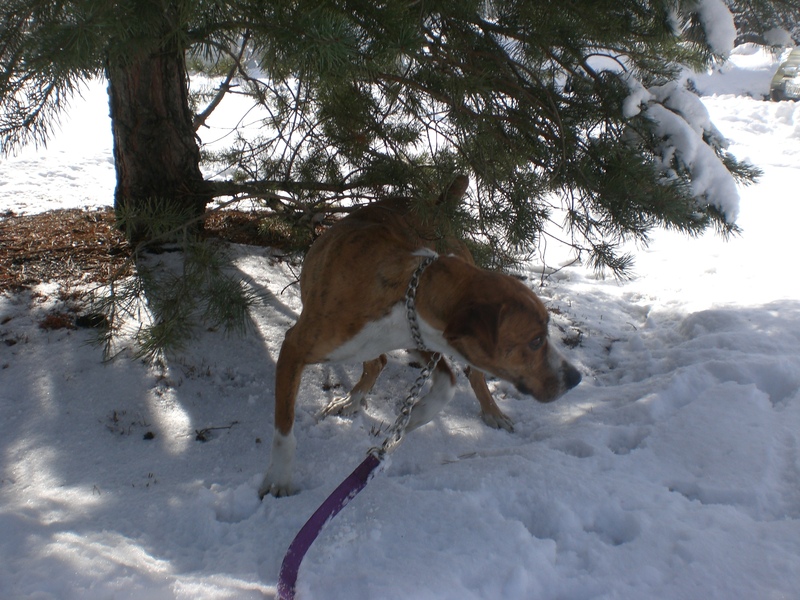 She seemed to be much calmer than Sage, and was more interested in walking and sniffing through the snow, rather than racing through it. That’s to be expected from a Hound dog with a Hound nose! Piper enjoys getting attention from people and will happily sit or stand at your side while you scratch her ears and back. She too would appreciate a walking buddy who will take her out to explore all of the fun scents in the neighborhood. 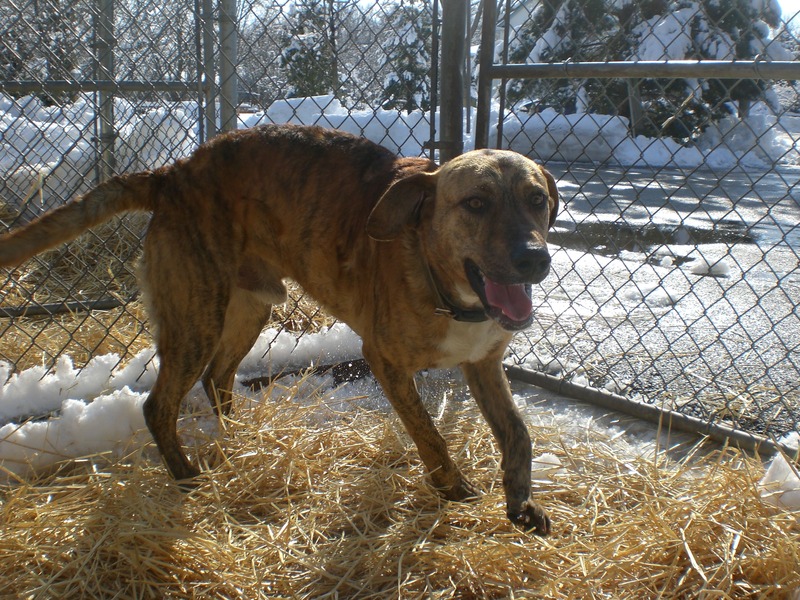 This Piper shouldn’t be confused with the other Piper, the male Shepherd mix, but they would both make wonderful pets! Uba the three-year-old Shepherd mix has one of the cutest faces currently at the shelter. Her face is a little darker than the rest of her, and her ears perk up when she’s excited. She’s a very manageable size, much smaller than the average Shepherd, and is a very happy girl. Uba is ready to share the love with her new family. When I knelt down to her level, she sat right next to me and started covering my nose in doggy kisses. She’s playful, lovable, and can’t wait to find a family to call her own. Come in soon to meet Uba! 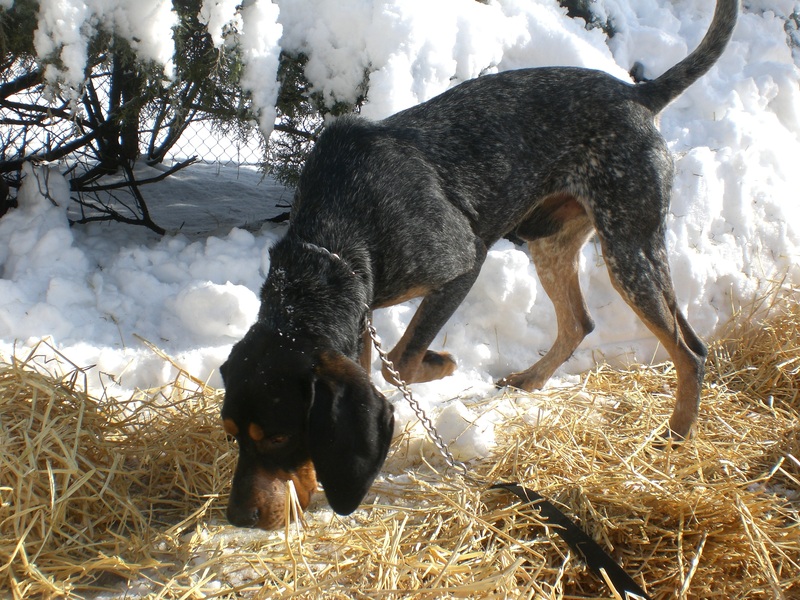 Mervin the two-year-old Bluetick Coonhound mix is such a handsome guy. Although he’s a big boy, he is very gentle and walks well on the leash. He can get distracted by a good scent, but that’s what he was bred to do! 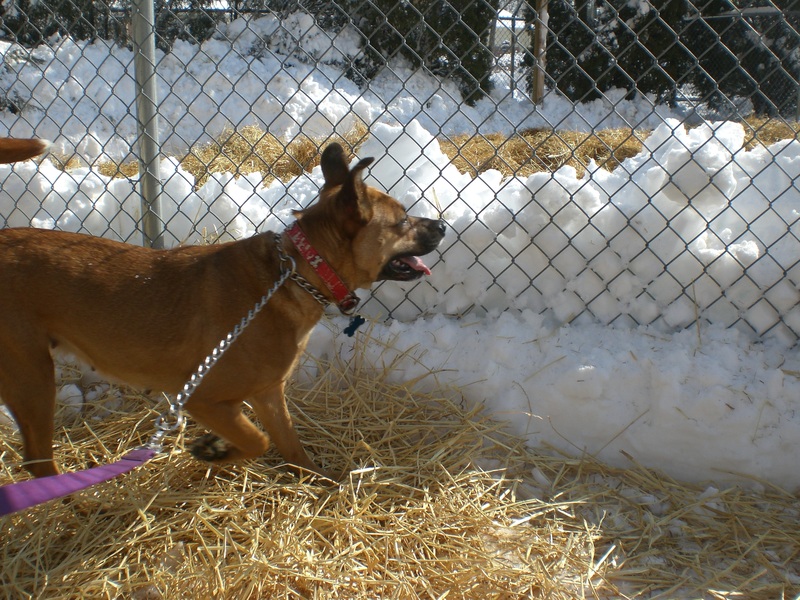 You would expect Mervin to have a big howl, but he was patiently quiet inside his kennel even when the dogs around him were barking. You can easily get Mervin off the scent trail by scratching his chin. He will happily stand next to you while you do so, and look at you lovingly with those sweet Hound eyes. His floppy ears would probably appreciate getting scratched every once in a while, too. Mervin is a gentle soul waiting for an affectionate family to come find him. Chopper the two-year-old Catahoula mix is a lot of fun. 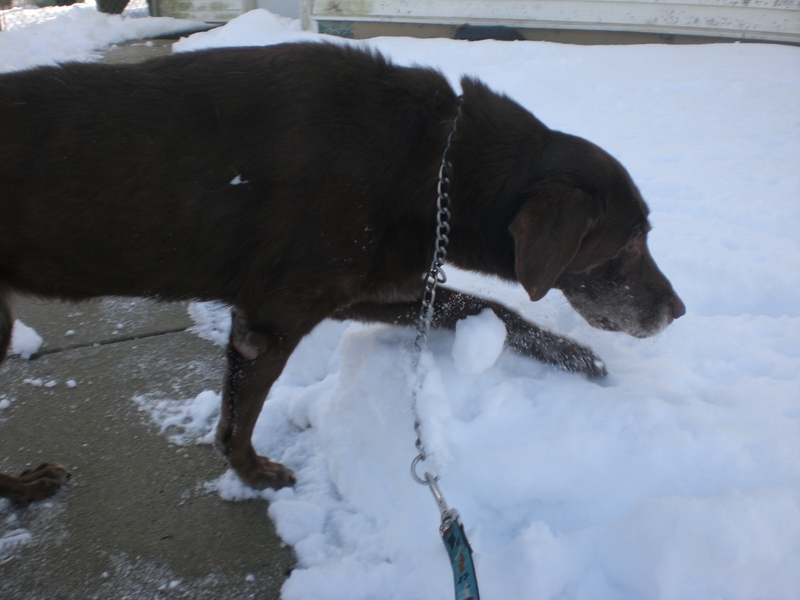 He also enjoyed bounding through the snow, and liked to climb up to the top of the snow piles to see what all was going on. He is a handsome, happy dog whose tail is always wagging and whose tongue is always hanging out the side of his mouth in a doggy grin. Chopper would make a great Valentine. He loves to give doggy hugs and doggy kisses, and will gladly receive hugs and kisses in return. With his energy level, he would enjoy long walks on the beach–or anywhere! Chopper is ready to give all of his heart to his new family. Is there space in your heart and your home for Chopper? 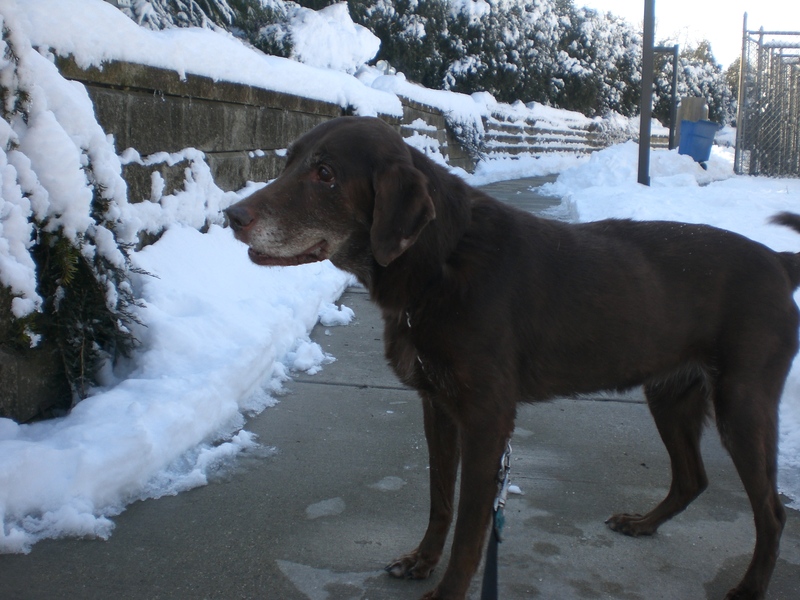 Coco the ten-year-old Chocolate Labrador Retriever mix is just a sweetheart. She is so gentle and so friendly. She is smaller than the average Lab, but has more than enough wonderful personality to make up for her size. 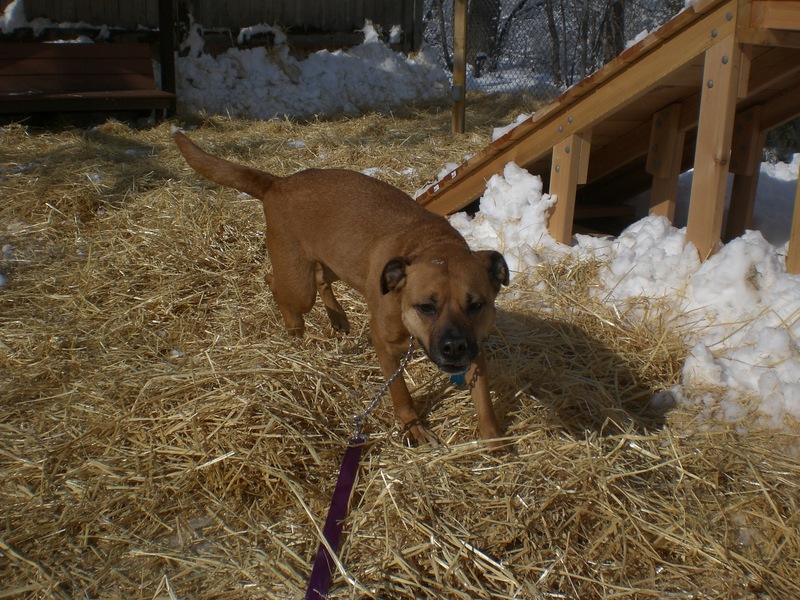 Coco is extremely easy to walk on a leash and enjoys all of the attention she can get. Coco is sure to bond quickly to whoever is lucky enough to bring her home. When we were finished with our walk, I passed her over to the Orphans of the Storm® photographer for her photoshoot. It appeared that Coco had already bonded with me, because her head kept following me wherever I walked. I ended up having to stand behind the photographer so she could get a good picture of Coco! Please don’t pass this sweet dog over just because of her age. She has so much more love to give. 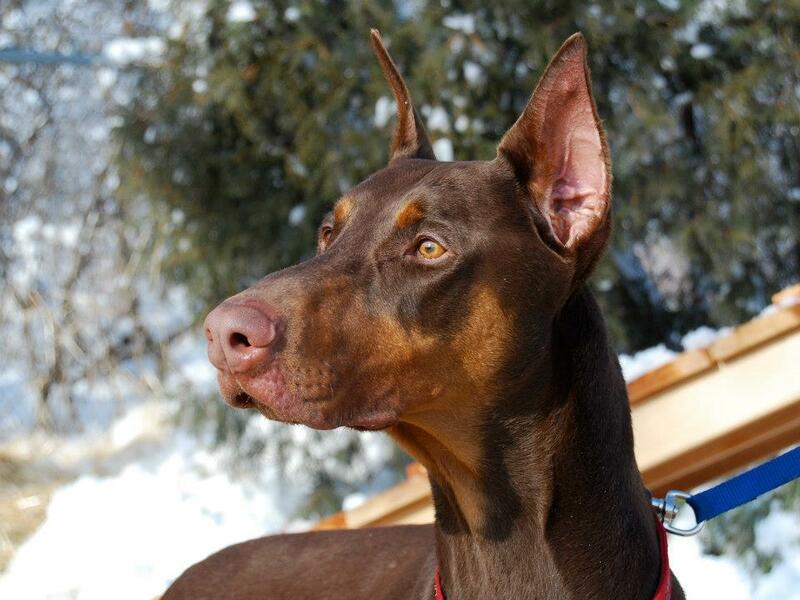 Kiedis the one-and-a-half-year-old Doberman Pinscher mix is an absolutely stunning dog. He’s a brown Doberman (rather than the usual black) with an attentive, inquisitive face. 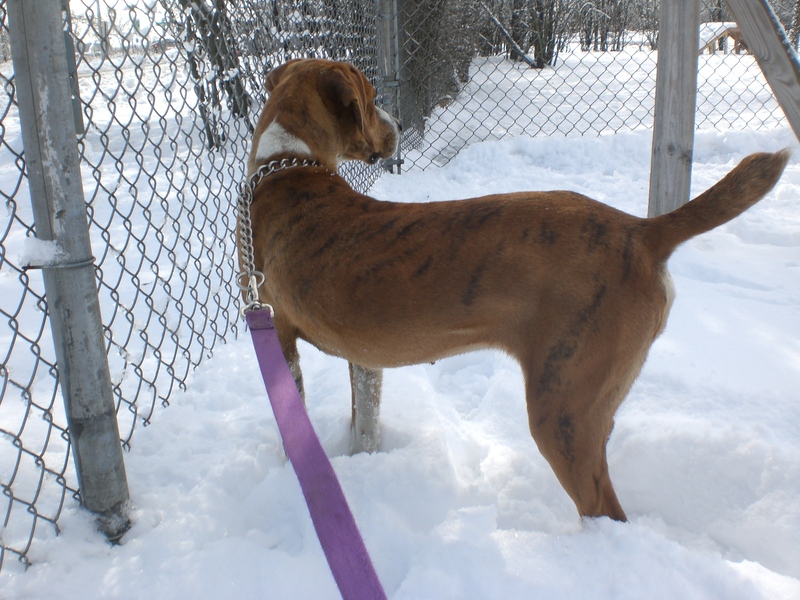 Kiedis came from a family with children, who unfortunately had to move and couldn’t take their handsome dog with them. Because we know he came from a family, though, he’s definitely housebroken and does well with kids. Kiedis, being a Doberman, is quite strong. When you first take him out, he might be the one walking you because he’s eager to stretch his legs. After he gets some exercise, though, he walks much better on the leash. He takes treats extremely gently from your hands and knows some basic commands like “Sit.” A dog like Kiedis will not be at the shelter for very long, so come in soon to meet him! 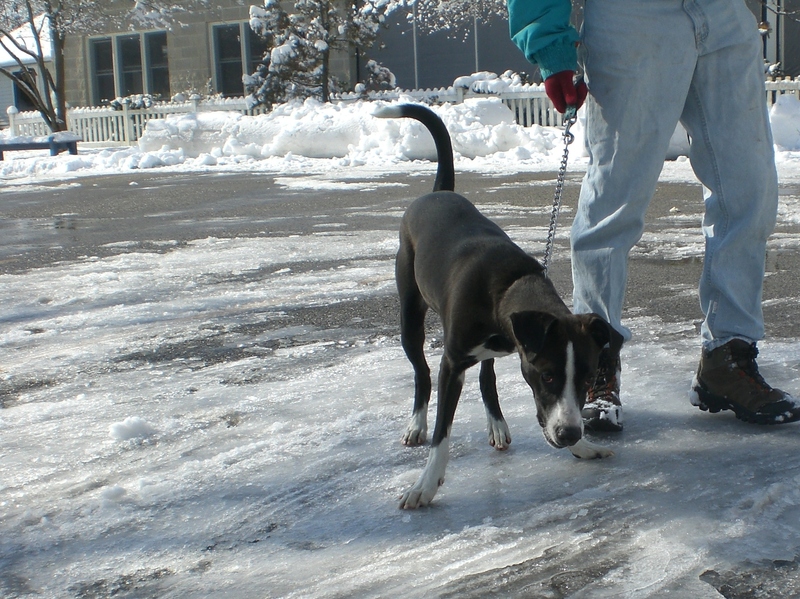 I also took Molly the Pit Bull Terrier mix out for a quick walk, and let her run around the yard for a bit. She had such a great time in the snow, rolling over onto her back with her legs kicking in the air. Even though Molly doesn’t like other dogs, she absolutely loves people and would make a wonderful friend in a one-dog-only home! Kennelmates Bandit and Lilly also got the chance to stretch their legs and play in the run. Orphans of the Storm® now has an agility bridge in one of the runs, and Bandit mastered it right away. He was so proud of himself when he got to the top! Lilly was a little skeptical of the bridge, but she was happy to sit and watch Bandit while I sat next to her and scratched her ears. Two more loving dogs ready for their new home! 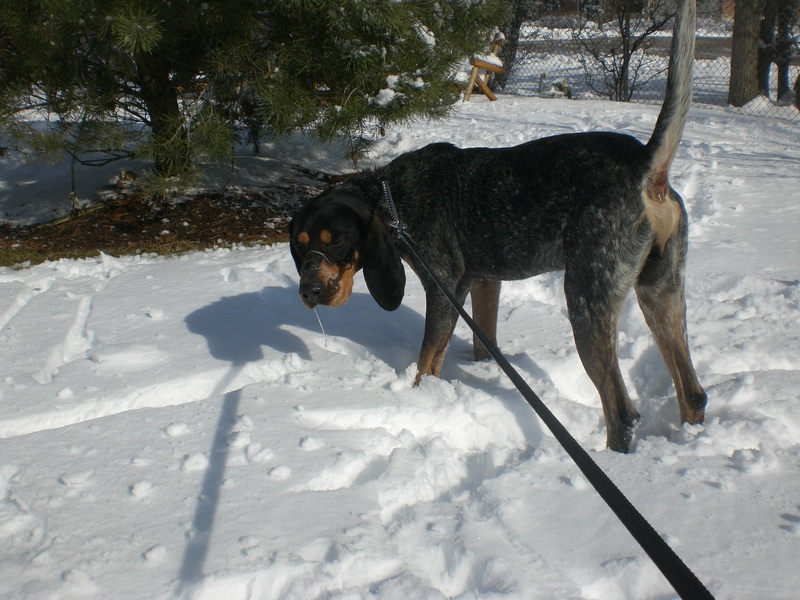 Posted by Meet the Pooches on February 13, 2013 in Dog Profiles and tagged adoption, animal shelter, Bluetick Coonhound, Border Collie, Catahoula Leopard Dog, Chicago, Doberman Pinscher, dog agility, dogs, Hound, Labrador Retriever, love, Orphans of the Storm, pets, Shepherd, Valentine's Day.